In Mundane Astrology, Time is connected with transiting planets over different nakshatras and degrees. The day an event triggered and Life progression in earth is preciously based on the movement of the moon in those stars. As moon progresses life grows in the earth and follows the system of night and day with the sun. Same way in the natal chart vimsotri dashas signifies how important events are connected with the nakshatras and our mind and the body setup. This shows how our state of mind changes significantly in those 29 days in a month when the moon changes significantly in transiting over different-different nakshatras with slow and fast-moving planets. This also shows how an important event has a deep impact on our psychological and biological system. Clearly justifies everything is relative in cosmos.Likewise, the Sun is responsible for the creation, same as the moon is responsible for the life and growth process and shows how we are connected with the day and night system. 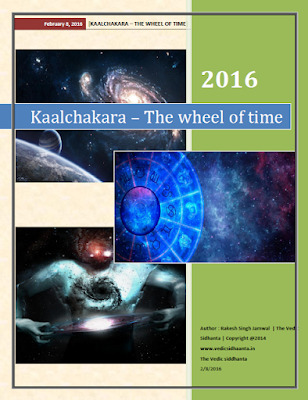 This shows everything is relative to each other; both time and Space are in relation to Kaal Chakra system. Same way every planetary movement has its unique role in displaying meaningful and eventful results in human life. We have seen how the wheel of time is exclusively linked with creation since the beginning of a cosmic era and how different planetary alignments with sun and moon invoke dynamic results in different signs and lunar mansions.